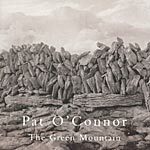 Pat O'Connor is a fiddle player from East Co. Clare and his music has the moderate pace and easy flow associated with that region. Recorded at the home of Quentin Cooper, who provides guitar accompaniments on most tracks, this has very much the feel of a field recording. Once can almost feel the musicians relaxing and "opening up" musically as things progress. On two of the tracks, O'Connor is joined by Josephine Marsh who traded her accordion for a fiddle on this particular occasion. Mostly reels and jigs from the local repertoire, with a set of waltzes and a march thrown in for good measure. Home-grown, "pure drop" traditional music.